As many regular readers of this blog will know, I am NOT a huge fan of Microsoft Word for writing. For writing journal articles and books I use Scrivener, which is a word processing program invented by a PhD student (true story). The genius of Scrivener is that it is designed with the work of a researcher in mind. It allows you to keep your document orderly while doing all the ‘other’ things that researchers have to do as they write: read stuff, look at stuff, plan stuff, back track, over write, rewrite, store notes, compare versions and other deviations from actual ‘writing’ too numerous to mention. If you want to hear me rave about Scrivener, you can read my previous post “Is your computer domesticating you?”, but today I want to talk about Microsoft Word. Yes, I still use Microsoft Word. It’s unavoidable when I collaborate with other people who have yet to drink my Scrivener Kool Aid and, although I am loathe to admit it, good old Word does things some things better than Scrivener. Microsoft Word is good at text formatting and managing multiple objects, like tables and dynamic graphs. For tricky formatting such as a thesis or long book with lots of graphics, Microsoft Word is probably still the most accessible and user friendly program out there (yes, I know there is LaTex, InDesign and various other products that make beautiful documents, but most universities don’t supply them by default and the learning curve can be steep). However, doing any sort of complex formatting operation in Word is deeply irritating because, to my mind at least, the tools are often unnecessarily complex and subtle. It’s one of the areas where users suffer most from the rampant feature bloat that has affected the program over the years. Generations of developers have added features, check boxes and new widgets which do all sorts of wizz bang things. As a consequence the buttons which control the settings and behaviours of the various formatting tools are of staggeringly byzantine complexity. Anyone who has attempted to bring a large, complex document like a thesis or a book to production will know exactly what I am talking about. There’s just so many damn check boxes hidden in layer upon layer of dialogue boxes that it’s impossible to know (or remember) where all of them are. That was until I received an unsolicited email from a South African self published author, Dr Jacques Raubenheimer asking if I wanted to review his book “Doing your dissertation with Microsoft Word”. I’ll be honest with you, I thought I would rather stab my eyes out with a pen than read such a tome, but I said “Sure!” (figuring that I could always get a student to review it if I just couldn’t face the task myself). Jacques duly sent me the book. When I picked it up from the post office the first thing that surprised me was how thick it was. As you can see in the photo, where I have included a pen for scale, the book is an inch or so thick – more like a manual one might get with the software than a ‘how to’ book. And that’s essentially what this book is: a manual for MS Word, but one that doesn’t suffer from the usual problems of this genre. One of the reasons that computer manuals are so damn frustrating is that they explain the features in a context free way. In other words, they tell you what the software can do, but not how to apply these tools to do what YOU want to do. But Raubenheimer (bless his cotton socks) has collected all the features you would want to put your thesis/dissertation text through a production process and organised them sensibly, in a way which echoes the workflow involved in seeing a large document through to print – and beyond. The book starts with the things you would expect – setting up pages, working with templates and styles. It explains, in sometimes excruciating detail, some of the features of word which I find most troublesome: section breaks, fields, tables of content, cross references and so on. In fact, just skimming through these sections (and it’s a book designed for skimming, not sequential reading) I got answers to problems that had been bugging me for years, like the reason section breaks can become invisible and how to make sure that columns and cells in tables line up again after a botched merge operation (for this alone I could kiss you Jacques). These two dialogs allow you to insert and delete entire rows or columns, but they also allow you to do what you should not: Insert or delete individual cells, thus distorting your table and making, I guarantee, life very difficult for you in the future. I appreciated these nuggets of super user wisdom and, overall, found myself deeply, deeply impressed with the depth of Raubenheimer’s knowledge. He comprehends parts of the program I have never had any patience or skill with, thus saving me the trouble of having to learn them. Alongside advanced walkthroughs of feature sets, sit text boxes where Raubenheimer explains particularly strange or esoteric formatting manoeuvres, or offers multiple ways of solving common, but tricky problems. This is, I think, where this book offers real value for PhD students and academics who need to produce books and reports. Raubenheimer has clearly worked with many thesis writers and understands the many variations and quirks that can occur in formatting specialised texts wth lots of dependencies. The only minor complaint I have is the very depth of knowledge Raubenheimer has, and the complexity of the subject he is tackling, makes the book, at times, very hard to read. It’s not that this book is badly written; merely that this kind of technical writing is extremely difficult to pull off and occasionally Raubenheimer doesn’t quite manage it. I had to re-read a few times in places to get a sense of what he was trying to say. However the screen grabs are helpful and the book is painstakingly indexed. Should you buy this book? Well, although I thought I would be happy to give it to a student to review, there’s no way I’m letting it out of my office now. It seems to have taken up permanent residence on my desk and pages are becoming dog eared. At around $30 US I think it’s a steal quite frankly. If a book like this was published by a mainstream publishing house it would be at least three times that price, if not more. As insurance policy for those last stressful weeks of compiling your thesis it’s probably worth the spend. 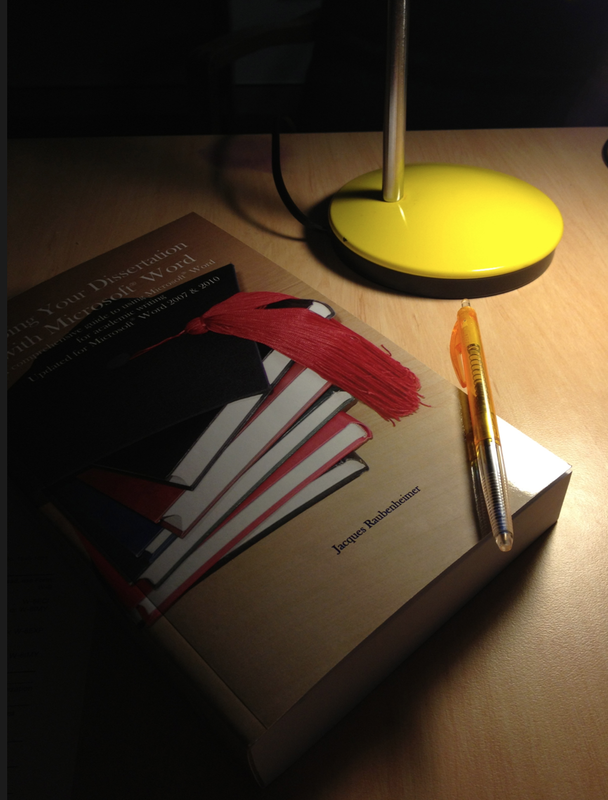 You may find it’s a book you want keep on hand to help your own students after you graduate. I do hope Raubenheimer gets enough sales to keep it updated for each new software release – but he has also started a blog, which is at least one way you can keep in touch with what he is doing. I have asked the ANU library to buy several copies. I hope this review is helpful to you – I’m happy to answer any further questions about it in the comments. If you are an author or a publisher with a study skills book you would like us to review, please send a copy to Dr Inger Mewburn, building 10T1 at the Australian National University, Acton, 0200. I often pass books to students to review, so stay tuned on Thesiswhisperer Twitter and Facebook channels if you are interested in writing one in return for a free book. This entry was posted in Book Reviews, Getting things done and tagged formatting, microsoft word, thesis production. Bookmark the permalink. « How I broke up with my supervisor. It isn’t available on Kindle! Sigh. OK, not so dumb question, is the book based on MS Word PC (2010 or 2013) or MS Word Mac (2011)? Same question as Rebecca – looking at the previews on amazon I suspect MS. Does anyone know though? And would it make that much difference? I need this book! As long as it covers Word for Mac. I’ve been going crazy trying to standardise the styles and give each section a different header. If you plan to write a complex document such as a phd, my humble advice is to download and learn LaTex. It is free. If your document is mainly text there is little to be learned. There are readily available templates for all styles of documents. If your document is technical the learning curve is somewhat steeper but the rewards are multiplied. Nice post. I used Word for my dissertation. The most important advice I can offer is to get all your heading styles, table of contents/figures/tables, and other organization elements in place before you start to write. Waiting until your dissertation or thesis is written will cause undo pain. I like what you write, keep on going! A great reason to use Word over LaTex etc is the widespread availability of plugins for most reference managers. An understanding of styles and document structure, knowing how to reference tables and figures and how to embed other MS objects in your Word doc, as well as using a reference manager from the start – made the technical sides of my PhD document trivial. Shame that writing it wasn’t quite so trivial! I’d recommend the Latex way as well; most reference managers will output a “bibtex” database (I use mendeley, but endnote or papers seem to have support) that works well for me with latex. Word certainly has an easier learning curve, but has a boat-load of issues that will come back and bite you later on. What are those issues Sam? I haven’t struck any, but am always hearing rumours of problems. An understanding of styles and document structure, knowing how to reference tables and figures and how to embed other MS objects in your Word doc, as well as using a reference manager from the start .. I purchased this book and started reading it and using it to format my thesis. The problem is that I use a Mac. I hoped it wouldn’t make that much difference but of course it does, especially for someone as computer illiterate as me. I need every step spelled out otherwise I will never get there. It did have the advantage of alerting me to what was possible and the best way to do things in general, and not all of the instructions on how to do things were completely useless. Mostly I learned what Word can do and then bullied my geek son into helping me do it. I now have a document with everything automated, tables, figures, headings, headers, table of contents, everything. Very comforting. Wondering if you have some really strong examples of the “three paper route” dissertation?